So you’ve decided to try regenerative medicine and are excited about your new journey toward relief. There’s nothing more settling than knowing that a solution is in sight, especially when the pain has been a constant nuisance and headache. Making that decision to receive treatments is a good start, but there are other decisions you need to make to increase its effectiveness. 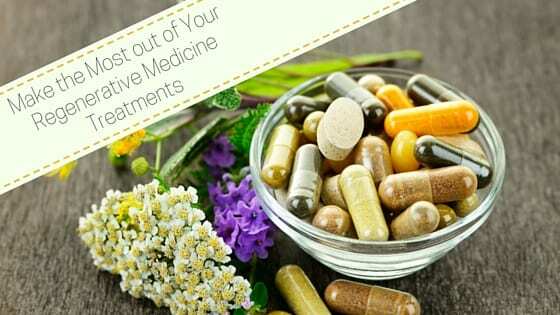 The one lifestyle choice we have in mind is altering your diet and taking supplements. Proper diet and nutrition are key components in living healthy; which means warding off diseases and signs of aging, as well as simply feeling good about yourself and body. But from a musculoskeletal and peripheral vascular perspective, the first step to embrace is nutrition. While several procedures are available to enhance cell regeneration none of them will be as effective if the body is nutritionally deficient. The main point that we want you to take away – if you plan on altering your diet to supplement regenerative medicine treatments – is that foods that cause inflammation should be avoided, and those that provide building blocks and essential substrates should be encouraged. What does this actually mean? It means that integrating an anti-inflammatory diet will give you the best results alongside regenerative medicine treatments. This is because foods that cause inflammation ultimately cause the production of free radicals (destructive particles that damage the genetic makeup of cells). This in turn has a great effect on your pain symptoms. In one study done from the University of Pittsburgh’s Department of Neurosurgery, an anti-inflammatory diet led to a significant reduction in symptomatology in three-quarters of patients. Approximately 70% of these patients were able to discontinue prescription medications. It can be a challenge incorporating these ingredients into your meals, so another great way to achieve the anti-inflammatory diet is by taking supplements. Curcumin is the active ingredient in turmeric with high anti-inflammatory and cancer-preventing properties – it neutralizes free radicals. Daily dosages require supplementation with other agents, which you can read more about here. Quercetin is an antioxidant found in most fruits and vegetables (giving it their pigment). It’s not best taken on its own, as this bioflavonoid should be taken with other bioflavonoids like Reservatol or Soy Isoflavones. Daily consumption is approximately 12.5 to 25mg per kg body weight, which translates to a range of 1,136-2,272mg when in isolation. Wobenzyme contains enzymes which break down proteins into smaller amino acids. These enzymes are like biological vacuum cleaners that rid the body of circulating immune complexes that can lodge in joints and cause harm. Wobenzyme is commonly used in Germany and the daily recommendation is 3 tablets twice a day on an empty stomach. Consult your doctor for proper dosages unique to you. Co-enzyme Q (COQ-10) is an important supplement that helps other anti-oxidants work better. It also seems to have an important role in mitochondrial function. Mitochondria are the body’s oxygen using power plants. Dosage varies depending on your condition and its intake purpose. For anti-inflammatory purposes, 60-150 milligrams daily for 2-12 weeks. L-Arginine 500mg (in sustained and immediate release formulation) can enhance blood flow. It should be taken two tablets at bedtime, preferably one week prior and through the course of regenerative medicine treatment. Shark Liver Oil 1000mg, taken two capsules daily (2 capsules = 1000mg), preferably one week prior and through the course of regenerative medicine treatment to stimulate and enhance immune system function. Stem XCell/Memory Cell should be taken twice daily, 2 tablets each time, for the first month then decrease to two tablets a day, preferably one week prior and through the course of regenerative medicine treatment to support stem growth and function. Bio Protein Velvet Deer Antler (IGF/HGH Enhancers) is administered through a dropper. 1/3 of a dropper sublingual and hold under tongue for 90 seconds, upon arising. CH Alpha (amino acids and peptides that promote proper joint metabolism and stimulate cartilage synthesis) is taken one tablet daily, preferably one week prior and through the course of regenerative medicine treatment. Surely this list gives you plenty of options to supplement your regenerative medicine treatment. Always remember that nutrition and diet will always be a major factor in your health, and that seeking other alternatives like supplements can provide the boost needed to make the most of your treatment.